A while ago, I was gifted a giant tub of bacon ends from a member of a different CSA. They languished in the back of my freezer until a deep spring clean last week. Bacon ends are a terrific thing to have in the house — even if you’re like me and fall into the “out of sight, out of mind” camp. Just make sure that you have them somewhere you can see them at all times, a visual reminder that every dish is better with bacon. Not only are bacon ends a good thing to always have on hand, but they are also much more economical than buying bacon strips. Chopped up and slowly browned, they make wonderful bacon bits. The rendered fat can be used in the place of oil or butter, or in anything that could be enhanced by some smoky porcine flavor. And let’s be honest, what wouldn’t benefit from added porkiness? People can sometimes be a little skeeved out by cooking with animal fat. However, so long as the pigs are pasture-raised by a farmer who follows organic practices, there should be no fear of needing Lipitor. Bacon fat from pasture-raised pork even has the added benefit of being a good source of vitamin D, making bacon fat certainly as good as butter! I’m not saying that you should sit around the house and chow down on scoops of it, but a little bacon fat is much healthier for you than all those omnipresent, heavily-processed vegetable oils. My rule of thumb is that the more steps in processing it takes to get the food to your mouth, the less healthy it is for you. I would even go as far as to argue that it’s not even food at that point. This is why I always shake my head at people who buy low-fat foods because in order to make up for the taste and flavor deficit, those items are generally bulked up with tons of sugar — which might be worse for you than the fat. Plus low-fat foods taste bad. Anyway, no more ranting. Back to the soup! Dried split peas scream for bacon! But if animals are not your thing, you can leave the bacon out and make the soup with smoked paprika instead. 1. In a large Dutch oven, cook the bacon or bacon ends over medium heat with a little bit of olive oil until most of the fat has rendered. Reserve a few bits of bacon for garnish. Spoon off all but one tablespoon of bacon fat. Keep the bacon fat in a clean container in your freezer, and use it for other things like roasting potatoes, eggs, roasting chickens, anything really. 2. Add the vegetables to the pot. Let them cook until the vegetables have softened and the onion is translucent, about 5-7 minutes. Add the split peas and toss them with the vegetables until they are evenly coated with bacon fat. Add the bay leaves, the stock and the water. Bring everything up to boil, and then reduce the heat. Let the peas simmer until they are tender, about 45 minutes to an hour. Periodically skim the top of the soup of scum and grease. If the soup seems too thick, thin it out by adding more stock or water. 3. When the peas are tender, you can leave the soup alone if you like a chunky soup. I like to partially purée the soup so that it is creamier, but still has some interesting bits of vegetables and peas in it. This is super easy to do with an immersion blender. Just insert the stick blender into the soup and blend as much as you like. You can also transfer half of the soup to a regular blender or a food processor, then add the blended soup back to the unblended half. If you use a blender, keep your hand smacked tight onto the blender lid lest it go flying off, leaving your kitchen covered in pea soup spray. Adjust the seasoning for a final time, and thin the soup with stock or water again if it seems too thick. Serve topped with a few of the reserved bacon bits, a dusting of smoked paprika and with some good, hearty bread. Anything with bacon is totally worth eating! I strongly believe that pigs were made to be delicious! Yum! I love split pea soup, but I always forget to make it. And I’m 100% with you on the good fat theory. Particularly if it’s made into good bacon! I feel the same way: I always forget about the humble split pea soup! I am always confused by people who freak out about lard and butter, but smear margarine all over their bread. I just don’t get how they think it healthier! I also can’t get over how bad it tastes because I really CAN believe it’s not butter! What a wonderful colour! I really am a soup lover and very much would like some of that in front of me right now! Thanks, Frugal! I really love soups too! I have some very nice meat-eating friends that I am happy to share! My neighbors share food the cook too — which is one of the few advantages of living in apartment buildings so long as you get along really well with your neighbors! Bacon ends are awesome to have around! I have some from my own CSA that I will be digging into soon! I think that you have definitely honed in on the #1 best way to get kids to eat their vegetables: cover them with bacon! Beats that Jessica Seinfeld thing of adding puréed broccoli to cupcakes any day! I love pea soup, but I’ve never seen bacon ends for sale. I shall keep my eyes peeled! I’m hoping to make bacon and will start this weekend I think. I have almost all the ingredients I need. Just need to pick up some non-iodised salt today and I’m all set. You’re making bacon? Good for you! I have been wanting to do that this year. I can’t wait to hear how yours turns out. If you make bacon, you will certainly have some bacon ends to put to delicious use! HOw did you manage to get your soup so green?! Mine ended up looking a bit grey…. I would love to attribute the soup’s color to the wonders of bacon fat, but I think that the real reason why the color turned out so well was the dried split peas. I hadn’t made split pea soup in years, but I saw some organic dried ones in the market that were just the brightest shade of shamrock green ever. I wish someone would gift me a tub of bacon ends! And I really love split pea soup. My friend Adam makes a recipe similar to yours, but lets a few thin slices of lemon simmer with the soup while it’s cooking. If you make this again, try it with the lemon–it really brightens it up! Oh, I forgot the lemon!!!!! You’re so right; it really does brighten it up. I won’t forget next time! OOOOOOHHHHH I covet your bacon! Split peas and bacon are such a natural marriage. And I love your bacon fun fact, which eliminates the guilt from overindulgence in lard. This looks like a perfect soup for the crap weather we’ve been having here. I hope you get better weather soon! We have had bright, sunny and horribly gusty weather. Like 20mph wind gusts. It kind of puts a damper on the sun when bits of dirt and who-knows are flying everywhere! But spring vegetables are coming in, and that is always very exciting! 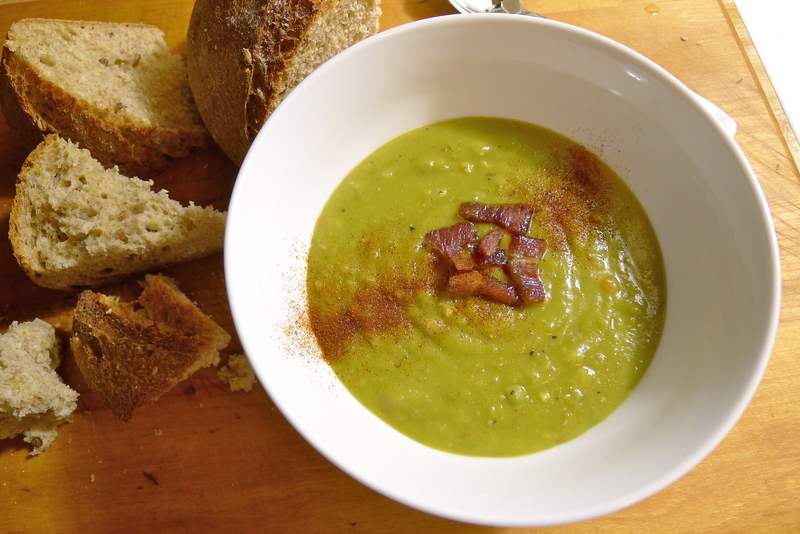 I love split pea soup with bacon and yours really looks delicious. A great photo. Thank you, Karen! Like the writing, I think that food photography progresses over time. They are both those kinds of things that you only get better at the more you practice. Thanks Malou! The paprika definitely bumps up the smokiness of the bacon! Yum! Thank you for posting such an awesome looking photo with recipe! I just bought some split peas and now I found you under a pinterest. I am so excited to try this. I am wondering if there is anything I need to do to the peas before putting them in the pan with the carrots? I read another recipe that required the peas to be soaked? Do I need to do this or can I cook them without soaking? Thank you so much Jacquelyn! Thankfully, you don’t need to do anything to the split peas ahead of time. They cook pretty quickly without any pre-soaking. I’ve never soaked them before cooking in any case. The only think I would do it take a quick paw through them and make sure there are no rocks or anything (there shouldn’t be nowadays). I hope that this helps. Let me know how it goes!